I've been riling a lot on poor antagonists so far, in 2018. It is my most sincere belief that they are the driving force behind most (and perhaps any) story. Andthey don't get the respect or reverence they deserve. But today I'm going to help you. Here are 10 antagonists I'm particularly fond of and why I believe they enhance the stories they're in. As usual, don't hesitate to tell me in the comments which ones are yours and why you think they should be on this list. Baby wants to fuuuuck. Frank Booth is a great antagonist because he seems like the only person who truly know what's going on in Blue Velvet. Hell, it might be all happening inside his tormented mind. He's not simply evil, he represents a vision of America without any rules of morals that law-abiding citizens of Norman Rockwell's version of American fear. He's the personification of a conservative ideological battle. Chigurh is great because he is mysterious. What he wants is clear (retrieving the stolen money from a drug deal) and not at the same time. He's taking way too much pleasure at his job in order to be an ordinary mob enforcer. I've always interpreted him as a metaphor for death, which keeps coming and coming at you while you're trying to make good for yourself. Anton Chigurh is a grim reaper for a pulp novel and that's what makes him great. He gives biblical undertones to a gangster movie. A personal favorite of mine. Not that many people watched Justified because it was a low-rent show on FX, but Boyd Crowder makes it worth your time alone. What makes him great is that he's as interesting and multidimensional as the protagonist of the show Raylan Givens. He's a side of his personality, a path he could've taken if his father hadn't been a two bits criminal. Both the characters and the actors playing them have great chemistry together and it feels weird watching two men who could've been great friends square off. Here's an underrated one. 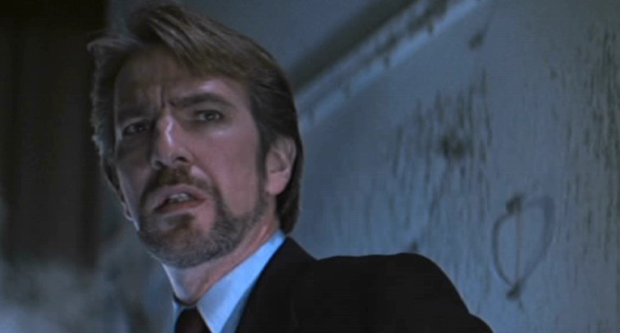 The first Die Hard is the best Die Hard becase of Hans Gruber. Not only he's the complete anthithesis of John McClane (slick, organized, well-dressed, in control), but he's also what McClane's wife wanted in her new boyfriend Ellis but didn't get (a stone cold businessman). Gruber is not just a thief, he's a reflection of who the McClanes aren't, but secretly wish for. They're fighting their shortcomings in Hans as much as they're fighting a criminal. There is a lot of analysis already written on why Heath Ledger's Joker is great. Simply put, he wouldn't exist without Batman's violent tactics against Gotham's criminals. When a city is too "clean" and people are afraid to not follow the rules, there's this autoimmune reaction that's created. A criminal so crazy and hellbent on chaos, he becomes unpredictable and impossible to control. As the Joker told Batman himself in the movie: "You complete me." Sometimes, the simplest characters work out if you play them hard enough. Vince McMahon (the character) is a glorified circus clown, but he's the king of them all. He really is a juxtaposition of the evil corporate CEO and a dorky, insecure father, but he's really the commanding structure from who everybody takes their cues. The WWE has played the corporation angle for close to two decades now and it has never not worked. Lost is one of the best shows there ever was if you don't count the silly plot. Its characters are so complex and always evolving, they were a pleasure to follow for a whopping 120 episodes. Nobody embodied J.J Abrams and Damian Lindelof's writing philosophy better than Sawyer, though. The mysterious swindler with trust issues slowly transferred from antagonist to protagonist over the years as the two writers kept peeling layers off his complex personality. Of all the characters on the two, he was perhaps the only one who found redemption. We need to talk about the most famous villain there is in pop culture. Sure, Darth Vader is an icon of evil that doesn't represent much more than the imperialist drive to conquer and assimilate. But what makes him so successful is that he represent that drive in all of us. He is the person we're afraid to become: violent and heartless. Darth Vader has a complex dynamic to his downfall. He was given power he couldn't responsibly handle and that's what makes him so compelling. What is Oliver Twist and Adolf Hitler were the same person? This is the conflict at the heart of The Wire's Marlo Stanfield, that makes him interesting. If a kid raised on the streets found success in violence and dictatorial political scheming, would you think he's horrible or the kind of the jungle? Marlo is the strongest character whenever he's on screen: he's smart, unwavering, he has clarity of purpose. It's hard not to root for him in the ongoing chaos of the street of Baltimore. The most talked about antagonist in recent years. Is he an antagonist or is he just a perverse protagonist who's finding success and fulfillment in all the wrong places? What makes Walter White interesting is that his personal success is at odds with the life he's built for himself (notably, with his family). Should one pursue success at the cost of other's happiness? Well, I'm going to ask you this: is Walter White doing anything than any businessman wouldn't do... aside from... you know, killing people?